Planned as a pedestrian/bike friendly community similar to Baldwin Park and Celebration, but on a much larger scale, the multi-use/bike trails throughout Lake Nona are primarily neighborhood and commuter trails running (mostly) parallel to streets. Other than the park area by the YMCA, there is virtually no shade. When the new Lake Nona Town Center is built out, amenities appear, and planned trail connectors are complete, this will be an interesting cool-weather ride. Bike trails and paths run throughout Lake Nona, linking neighborhoods, schools, parks, and business. Most biking is parallel to roadways, but some goes through parks, providing welcome shade. 44 miles of trails are planned when the Lake Nona community is built out. 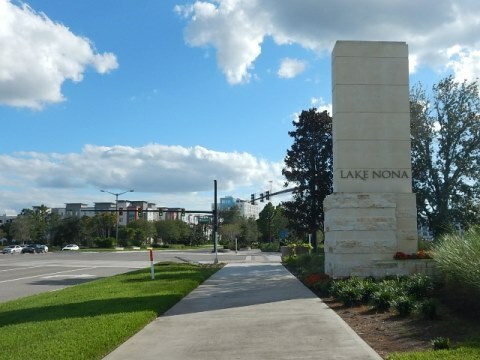 The Lake Nona Medical City is linked by trail to Lake Nona neighborhoods. The Medial City includes the University of Central Florida College of Medicine and Health Sciences, Sanford-Burnham Medical Research Institute, the Orlando VA Medical Center, Nemours Children's Hospital, a University of Florida Research and Academic Center, and more to come. Central Florida Veterans Memorial Park is located next to the VA Medical Center. A bike trail parallels Moss Park Road leading to Moss Park. At this writing, one mile of the trail to the park remains to be completed. Along Moss Park Road another short trail comes in from John Wycliffe Blvd. This trail loops around a small lake and past the USA headquarters of Wycliffe Bible Translators.